Home / Scottish Brick and Tile Industry / Maddiston Brickworks, Muiravonside, Stirlingshire. 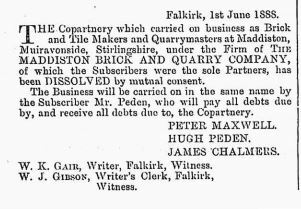 Below – 05/06/1888 – Edinburgh Gazette – Maddiston brick and quarry company dissolved – Hugh Peden, Pater Maxwell and James Chalmers. 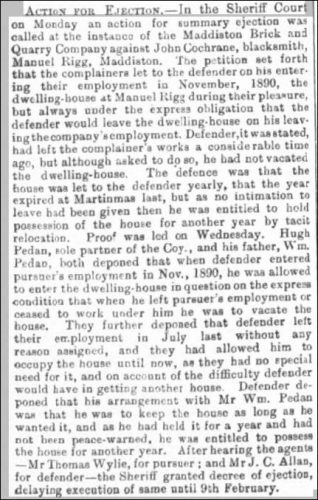 Below – 12/12/1891 – Falkirk Herald – Ex Maddiston Brick Works blacksmith taken to court after he left the company but refused to move from the tied cottage. 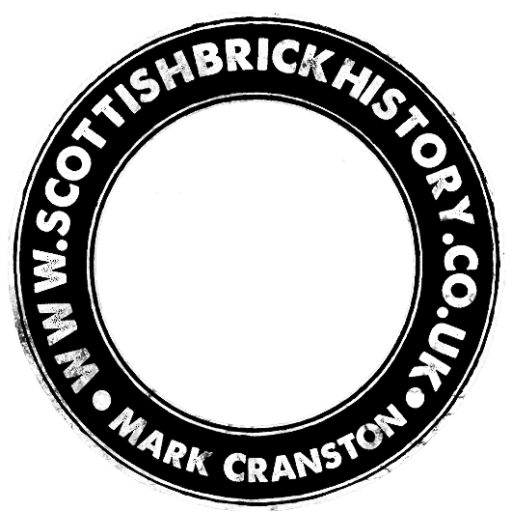 17/03/1892 – Edinburgh Evening News – Brickmaker wanted – Also smart girl, about 16. Contract may be made with steady man. Maddiston Brickworks, Polmont Station. 1893 – Hugh Peden, Maddiston. 01/06/1895 – Falkirk Herald – Smart girl wanted to carry bricks off moulding table. Maddiston Brickworks. Below – 1896 – Maddiston Brick Works. 28/07/1896 – Dundee Advertiser – Article dated 05/01/1897 refers to 2 men dying as a result of a boiler explosion at Madiston (Maddiston) Brick Works. 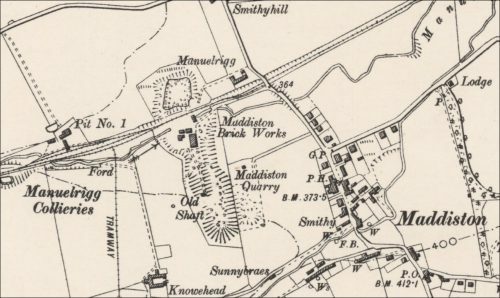 25/06/1897 – Glasgow Herald – Quarry and Brickworks – Stirlingshire Quarry and Brickworks – To Let on Lease, for such period as may be agreed on, Maddiston, Freestone Quarry and Brick Works, in the Parish of Muiravonside, as lately occupied by the Maddiston Brick and Quarry Company. The Works are on the Blackbases Branch of the North British Railway. The Quarry has been worked for a number off years, and is capable of much greater development. It yields a very fine quality of Freestone for building purposes, which has been in good demand to the locality. The Brickworks will be reconstructed by the proprietor on modern principles, with all necessary Machinery, &c., or it may be arranged that the tenant rent them himself. The tirring of the Quarry contains first-class material for common building bricks, and a portion of it is fireclay of good quality. For particulars and Conditions of Let, apply to John & W. K. Gair & Gibson, Writers, Falkirk. Offers to be lodged with them not later than 22nd July. 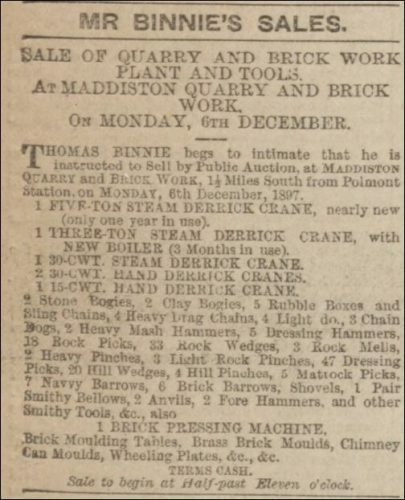 Below – 04/12/1897 – Falkirk Herald – Sale of Maddiston Quarry and Brick Work. Found at Bo’ness, Firth of Forth. Maddiston Brickworks, Muiravonside, Stirlingshire. . . . .